OnStage Performance Group is a community theatre group dedicated to encouraging the participation of all community members in the performing arts. We provide the opportunity for members to develop and evolve skills that can translate from the theatre to life. 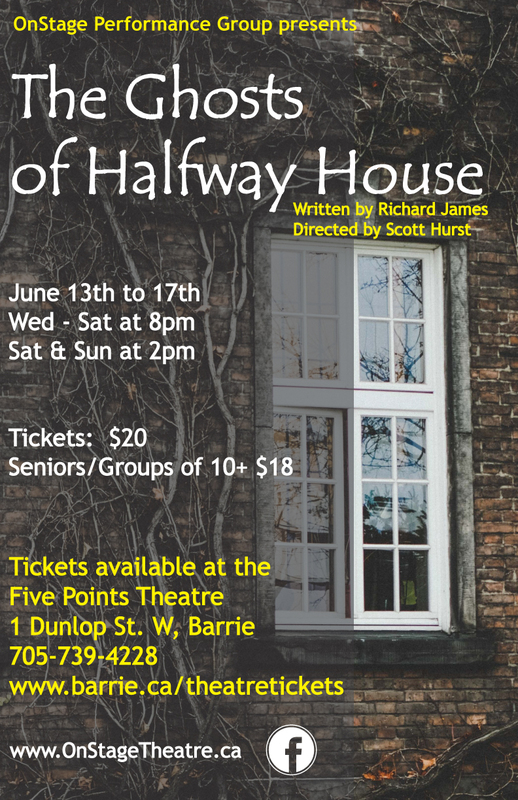 Join us Wednesday, June 13 through Sunday, June 17th for this tale of real estate and relationships. Simon and Daphne are looking around an old house, with Simon’s mother in tow. They aren’t convinced it’s the right place for them, and Mr Godley the estate agent is unusual. They’re in for quite an evening before they find out more than they expected about the house and it’s history. Tickets are $20 each ($18 for seniors or groups of 10+) and can be purchased through the Five Points Theatre box office. 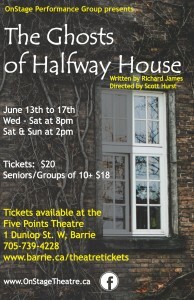 Visit them in person at 1 Dunlop Street West, by phone at (705) 739-4228 or online at www.barrie.ca/theatretickets. We are pleased to partner with Senior Wish Association for our opening night. A portion of our proceeds from that night will go to this fantastic local charity. For more information visit their website at www.aseniorwish.com.